MicroStep – renowned Slovak producer of CNC energy-beam cutting machines is a known innovator with more than 18 years of experience in the field of bevel cutting. Initial development of rotary beveling heads for plasma cutting with tilt up to 45° has been gradually supplemented by beveling heads for waterjet, laser and oxyfuel cutting. Today, MicroStep is producing its fifth generation of plasma cutting bevel heads - the so called plasma rotators – with never-ending rotation and torch tilt in the range of ± 50°, while in the near future new improved head will be introduced to the marker, featuring torch tilt up to 65°. This is in accordance with growing demands for accuracy and weld preparation. Next to the standard bevel heads, MicroStep has also been working on the development of special rotary beveling head with pantographic arm for cutting 3D parts out of pipes and profiles, accurate dome cutting and cutting of open H, U, I or L profiles. Apart from the cutting heads, the focus of development is also on the improvement of the cutting technologies, new methods for compensation of the physical limits of the cutting technologies focused on higher accuracy, functionality and long-term stability of the cutting tool. The results of this development are for example the auto-calibration of tool geometry (ACTG), Adaptive bevel compensation (ABC) or the Smart torch height control (STHC) for cutting of variable bevels. Next to cutting of flat sheets, MicroStep has long been involved with cutting of 3D shapes. Either by rotating the workpiece along its longitudinal axis in combination with the movement of the cutting tool above the surface of the workpiece or by special multi-axis cutting heads enabling cutting into a workpiece statically placed in the work zone of the machine. While solving certain customer tasks, application of a robotic arm showed some promise. This was thanks to wide movement range of such arm which would allow cutting of different sized workpieces. Apart from construction issues with integration of a robotic arm into a CNC cutter there are mainly the special tasks for the control system developers. The robotic arm brings a whole different type of kinematics, few more motoric axes and requirements for controlling the cutting technology mounted on the robotic arm. 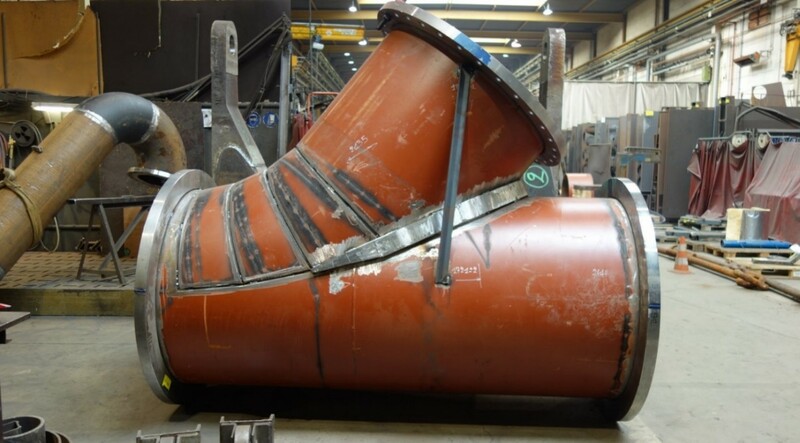 The solution ordered by Belgian-Luxembourg company Jan De Nul, known for its marine building and sea bed dredging mega projects (JDN’s fleet has partaken in the building of the new Suez Canal in Egypt or the Palm islands in Dubai) consists not only from the robotic arm with mounted oxyfuel cutting torch but also from plasma rotator for bevel cutting of metal sheets and a straight oxyfuel cutting head for straight cutting of thick flat parts. This setup consists of 14 simultaneously controlled movement axes and may be upgraded with additional heads (drilling, marking…) according to the customers’ requirements. In order to achieve seamless switching between cutting heads, the control of the robot has to be integrated into the operating system of the CNC machine responsible for all the mechanical modules of the cutting system. Even though robotic arm manufacturers supply their products with their own operating system, its implementation may present several obstacles like incompatibility of the communication interface, too low refresh rate of the desired effector position, insufficient feedback speed or the problem of coordinating with other movement axes of the machine. MicroStep developed its own software modules within the iMSNC control system which cooperate flawlessly with the rest of the system. The solution takes into account mechanical tolerances of the individual robot joints and the movement specifics arising from the arm’s construction. 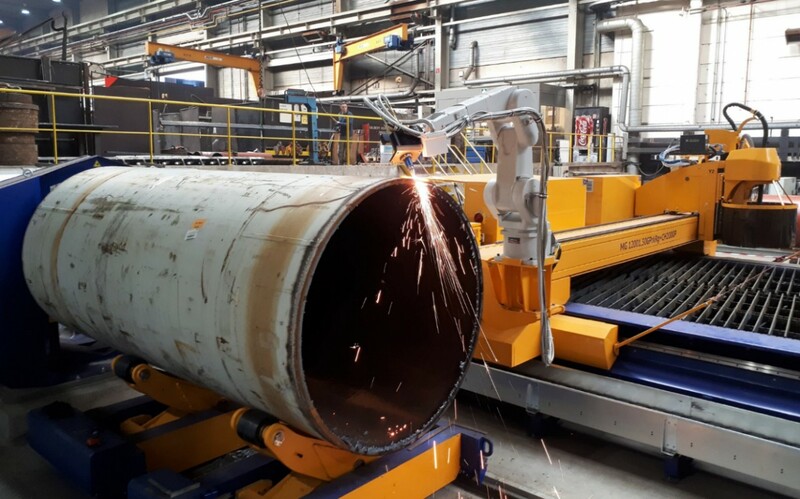 The solution consists of gantry type machine with 12 x 3 m large cutting area for cutting plates up to 150 mm thick and a zone for cutting pipes with a robot situated along the outer side of the machine guide, the maximum pipe diameter is 2000 mm and maximum wall thickness of the pipes is 80 mm. In addition to the robotic arm, the machine is equipped with a straight oxyfuel head and plasma rotator capable of tilting ± 50° (fig. 3) with integrated 440 A plasma source, allowing plasma bevel cutting of materials up to 50 mm thick. Machine axes (X, Y and Z) are automatically calibrated thanks to fully automated calibration station (ACTG). The patented ACTG system ensures that each measured movement deviation is automatically compensated by a machine countermovement without the need of manual input by the operator which saves a lot of time and has a significant impact on the long-term accuracy of cutting. The endless rotator has a built-in collision protection and automatic torch height control, which enable accurate cutting of V-, X-, and K-cuts. The machine moves on accurate linear guidelines from THK. Coupled with the motors they ensure high dynamics of the MG machine while maintaining superior bidirectional repeatability and allowing the machine to use the full potential and all features of the installed HD plasma source such as accurate cutting of small holes, small contours or adaptive bevel compensation (ABC). The machine for JDN is special because of the unique solution of pipe cutting. The pipe cutting zone consists of a positioner for clamping and subsequent rotation of the pipes and from adjustable supporting rollers on rails which can be set to accommodate different pipe diameters. The challenge was to ensure cutting and positioning of pipes in the entire required range of diameters and wall thicknesses (Ø 100 mm – Ø 2000 mm, walls up to 80 mm thick) and at the same time think of a technical solution which would allow the most convenient manipulation with the pipes with minimal construction changes to the production hall. For these reasons the chosen solution was an oxyfuel torch mounted on a robotic arm placed on the end of the gantry. Robotic solution presents better movement flexibility and isn’t limited by the height of the gantry (Fig. 2), so it was possible to place the rail track with the supporting rollers on the floor level without the need to “sink it” underground. A Mitsubishi robot was chosen for the task. 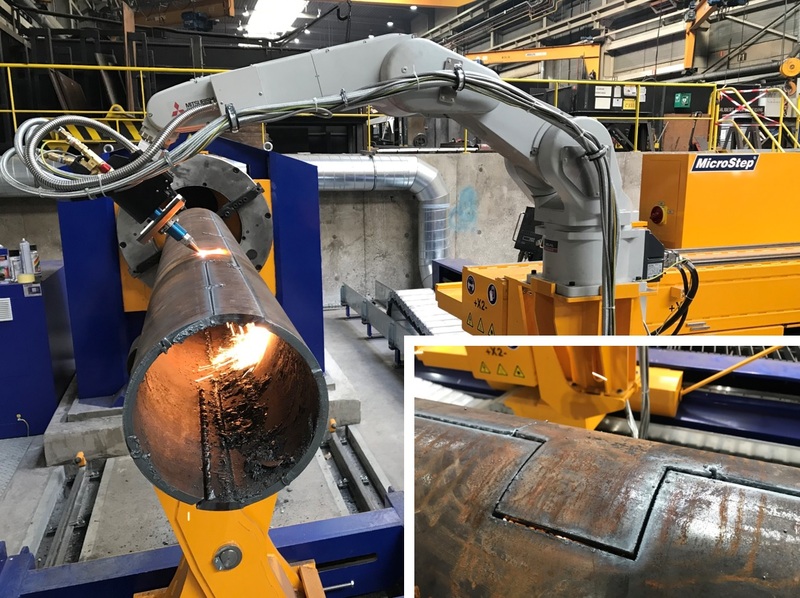 It carries an oxyfuel torch with integrated capacitive height sensor and a laser scanner that is used for scanning of the real shape of pipe in the spot of cutting. If any deviations will be detected via scanning process, the cutting plan will be adjusted accordingly. The scanner in combination with a sophisticated robot movement control (compensating of the existing inaccuracies of robot construction) and dedicated creation of cutting plans in 3D CAM software mCAM allows to achieve accurate cutting of openings and contours of different shapes (Fig. 4). Pipe cutting zone is equipped with a safety light barrier which turns on together with the robot and protects the operator and other employees in the vicinity. An important part of JDN’s strategy is the continuous investment into new technology and equipment. Let’s illustrate this by looking at JDN’s own fleet. It consists of more than 85 ships, 47 of which were built between 2007 and 2013. Among other things, the group can work with sister ships Cristóbal Colón and Leiv Eiriksson with hopper capacity of 46 000 m3 making them the largest trailing suction dredgers in the world. There are 70 operators working in the production department. 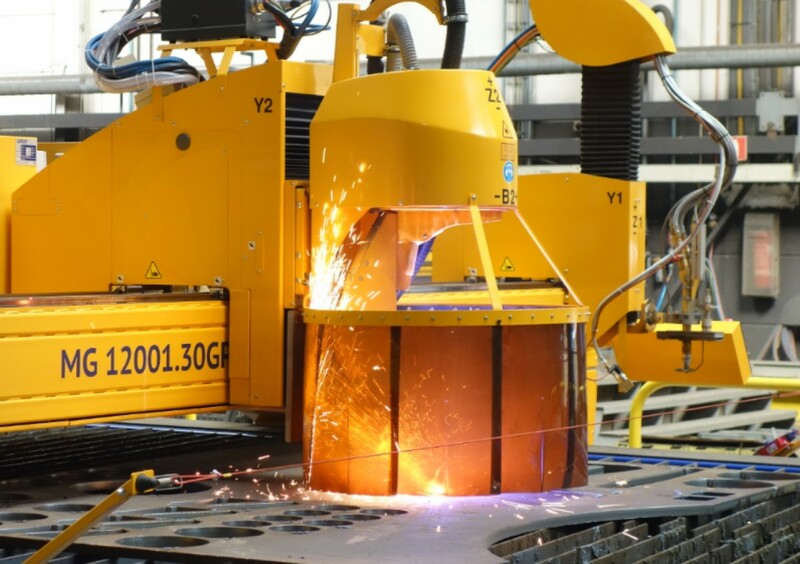 “First of all, the plasma/oxyfuel cutting machine with integrated robot has resulted in considerable time saving because all the weld preparation is now done automatically and in one step which also increases quality. 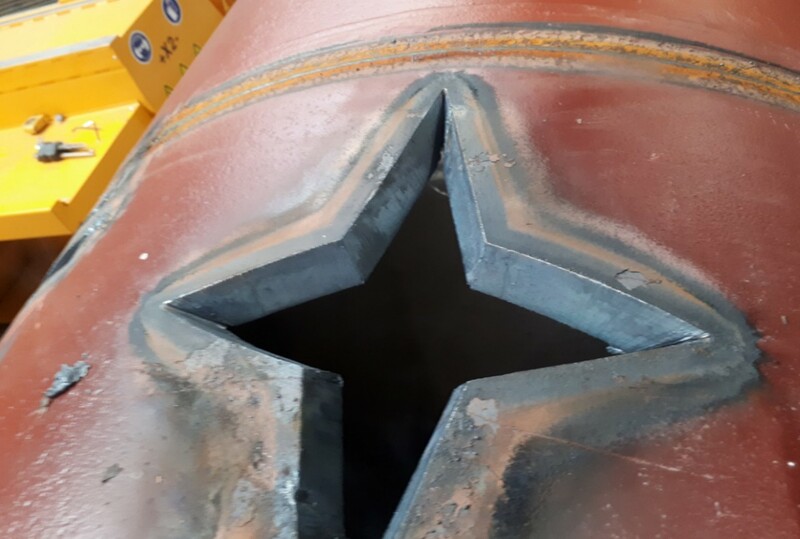 As to the pipe cutting, not only has our reach been increased, but we can also cut any shape. In terms of flexibility we have significantly improved,” adds José Pycke. MicroStep has been developing bevel cutting for over 18 years, supplied its customers with more than 650 bevel cutting heads and the implementation of a robotic arm has been the next step towards application versatility in the cutting business.